Second gen Countryman to make world debut at the 2016 LA Auto Show. MINI unveiled the second gen Countryman crossover, ahead of its world debut at the 2016 LA Auto Show on 18th of November. 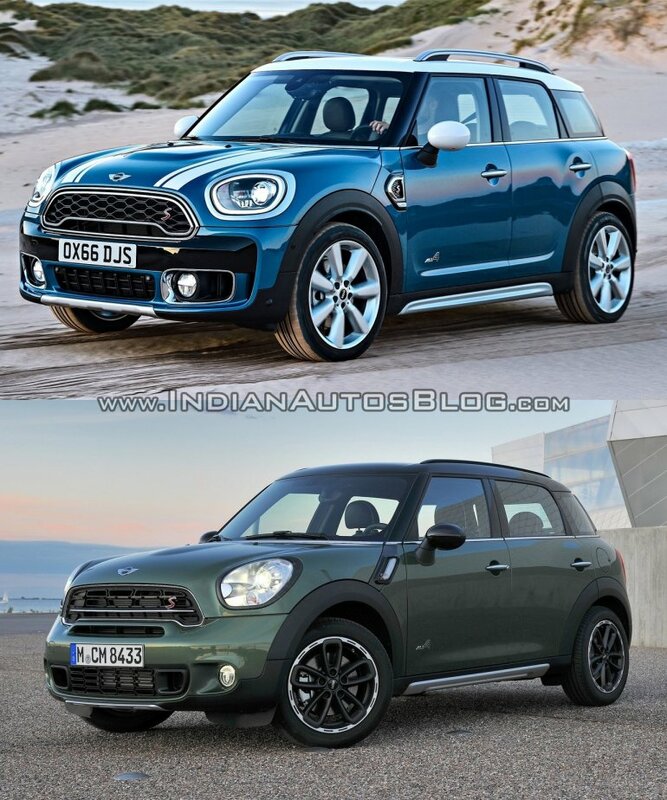 Here's a pictorial comparison between the 2017 Mini Countryman and the outgoing model, which was introduced in 2010. Upon first glance, it's clear that the new Mini Countryman, though retaining the three-way structural design, has grown in size. Compared to the outgoing model, the new Countryman is 20 mm longer, approximately 3 mm wider and has a 7.5 mm longer wheelbase. It is now the largest Mini ever made in their 57 year history. The styling, as expected, is evolutionary in nature. The front-end retains the unique Countryman grille, but features smaller LED headlamps with peripheral daytime driving light ring, an aggressive bumper design and new engine hood. Changes to the profile are limited to the new side intakes design, new alloy rim designs, and thicker roof rails. The rear-end gets similar taillamps with LED lighting, repositioned registration plate area and a new bumper design. The floating “helmet roof” seen on all modern-day Minis, is preserved. 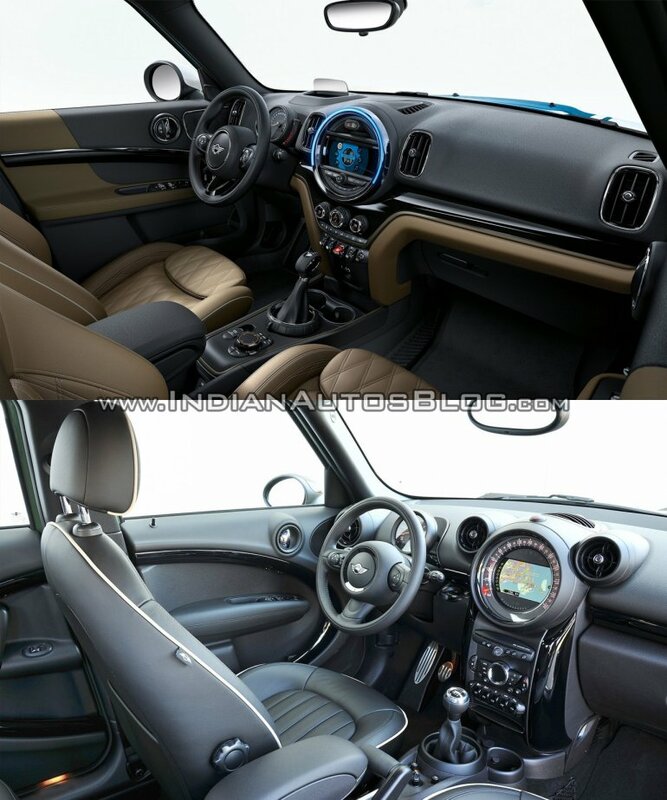 The interior styling of the new Countryman looks less quirky than the outgoing model, borrowing cues from the latest crop of Minis. The design of its center console is new with fewer buttons and more premium trim options, such as the MINI YOURS – British Oak illuminated, where translucent sections in the trim strips help to generate vivid patterns during day and night. It still has the dinner plate-esque element on the center console, which houses a wider touchscreen infotainment system with touch capability, and a host of new features including MINI Find Mate. The speedometer that used to reside around it now a conventional dial in front of the steering wheel. Mini says that the horizontal segments endow the cockpit a visually broader and more modern look. The luggage compartment volume is 450 litres and can be extended as required up to 1,309 litres. This constitutes a maximum increase of 220 litres in contrast to the outgoing car. Some of the new features in top variants of the new Countryman include Head-Up Display, 8.8-inch touchscreen MINI navigation system Professional with Touch Controller on the centre console, Parking Assistant and Head-Up-Display, Harman Kardon hi-fi sound system, LED interior lighting and LED ambient lighting.